Fed up! Perhaps they didn't hear you the first time. Every so often, you have to redeliver the message. That’s exactly what happened in 1975, when a Third World Coalition led by Black students occupied University Hall for 38 hours. Black, Latino, and Asian American students’ snaked through University Hall, equipped with their voices and drums reverberating, a robustly creative ruckus of music, dance, and rhythmically sounded demands. Equal access, visibility, and services; are these reasonable demands? 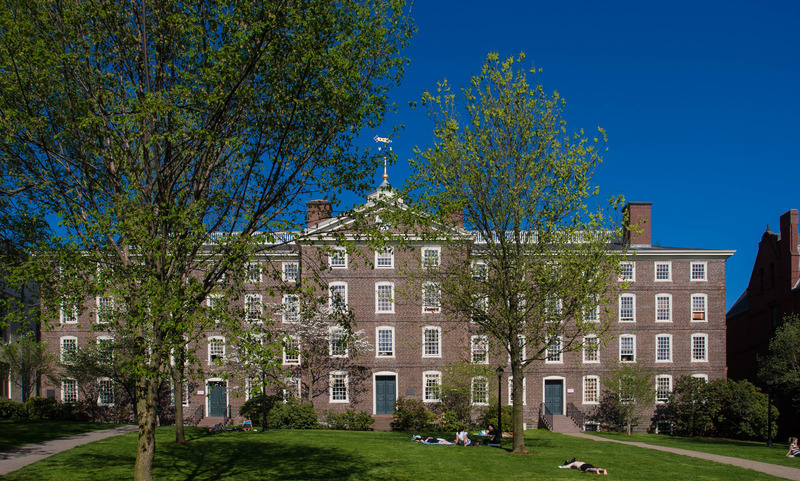 Brown University’s planned budget cuts would decrease financial aid, student services, ultimately reducing the population of minority students, staff, and faculty. In an attempt to persuade the University to rethink their decision, students formed an alliance demanding to view the budget, and to be part of the conversation. For two months students of color attempted to have a seat at the administration’s table to address their concerns, but access was denied. They assembled and deliberated, but the administration didn't budge. They organized campus rallies, but the students’ demands were unmet. They put forth a list of demands, most notably an increase in scholarship funding from the administrations’ amount of $3.3 million to $3.5 million. They also demanded that the Black student body proportionately reflect the national percentage of Blacks in the United States—which echoed a demand from 1968. Despite the students’ orderly negotiations and clearly outlined requests, plans remained in place to proceed with the budget cuts. Nearly 3,000 students went on strike on April 14, 1975, ditching pencils for picket signs to stage a protest. With very little revision, the Advisory and Executive Committee passed a new budget. Had every option been exhausted? University Hall housed the office of the president of Brown and other administrative offices, and was a place for the students to be heard. The students believed that confrontation demonstrated their seriousness and commitment. On April 24, 1975, students occupied University Hall for nearly two days, insisting the university fulfill the promises they made to Black students during a 1968 walkout. The 1968 walkout, staged by twenty-three Black women of Pembroke College in solidarity with Black male students from Brown University, demanded several changes in the admissions process. The Dean of Admissions refused the first and most important demand: an increase of the black student population to eleven percent enrollment for the class of 1973. On December 5, 1968, the Brown Daily Herald reported, “A substantial majority of black undergraduates at Brown and Pembroke will dissociate themselves from the University at noon today…” The debate around Black presence and representation in education—and by extension in America—was not new. 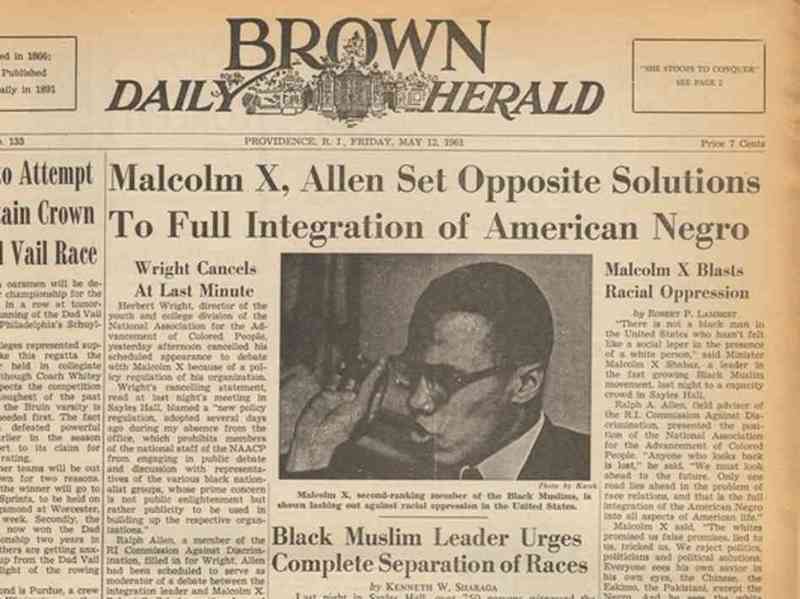 In 1961, Malcolm X spoke at Brown on racial oppression, Black Muslims, and, in his eyes, the need for dis-integration of Blacks in America to move toward liberation. The irony of Brown University’s complicated relationship with Black America is the role of Black Americans from the institution’s birth. University Hall, the oldest, and until 1832, the only building on Brown University’s campus, was financed with revenue from the slave trade and built in part by Black slave hands. In recent years, Brown has commissioned a slave memorial in an effort to recognize the Brown family’s role in the slave trade. This documentary explores the 1968 walk out led by African-American students at Pembroke College. 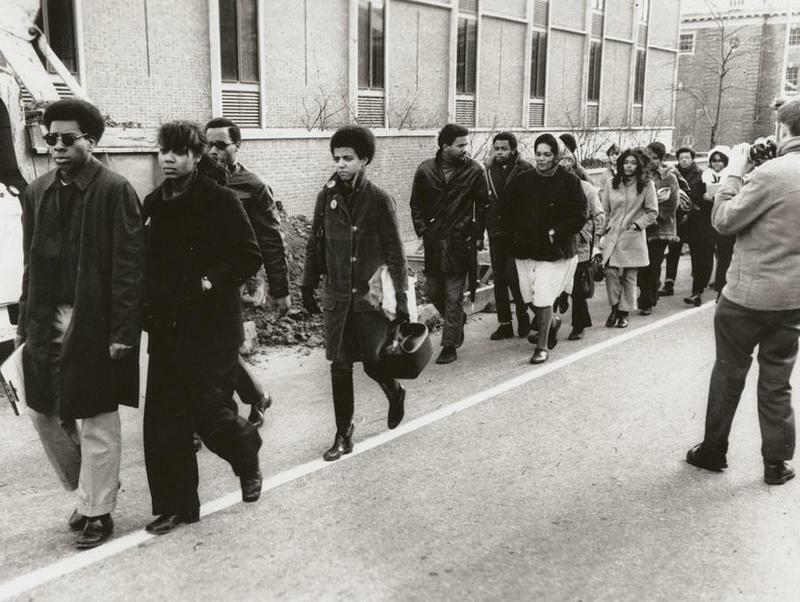 The 1975 Black Walkout: In 1975, nearly 3,000 Brown University students staged a walkout, abandoning their classes and campus in protest of budget cuts they believed would adversely affect the diversity of Brown's population. University Hall, 2007: Some donors to the construction of University Hall honored their pledges by allocating use of their slaves for labor for a set number of days. Other funding for Brown's oldest building was derived from profits earned through the slave trade and the ownership of slaves. Jazzmen Lee-Johnson, “The Brown Founders' Legacy,” Rhode Tour, accessed April 21, 2019, http://rhodetour.org/items/show/42. Geovanis, Steven B., and Nicholas Leman. “3000 Rally in a Brown Budget Protest.” Harvard Crimson. April 11, 1975. Gleck, James. “A Bread and Butter Takeover.” Harvard Crimson. April 26, 1975. Mitchell, Martha. “Encyclopedia Brunoniana.” http://www.brown.edu/Administration/News_Bureau/Databases/Encyclopedia/. “Report of the Brown University Steering Committee on Slavery and Justice.” Brown University. http://brown.edu/Research/Slavery_Justice/documents/SlaveryAndJustice.pdf. Sharaga, Kenneth W. “Black Muslim Leader Urges Complete Separation of Races.” Brown Daily Herald 90 133 (1961). Warren, Peter. “Blacks Set to Leave University.” Brown Daily Herald 102 124 (1968).